We have an aging population, by 2030 all baby boomers will be over the age of 65. The number of Americans age 65 and older is projected to more than double from 46 million today to over 98 million by 2060, and the 65 and older age group’s share of the total population will rise to nearly 24 percent, from 15 percent. With an aging population, this will lead to a significant increase in dementia-related diseases and a need for addressing incapacity planning as part of a complete wealth management plan. As advisors, we realize many of our clients are in need of financial guidance when providing care for an aging parent. If this is something that you are in the midst of — or anticipate being a concern in the future — below is a Caring for an Aging Parent Checklist to help ensure your parent’s financial situation is in order so that you can focus on the emotional support of your loved one. 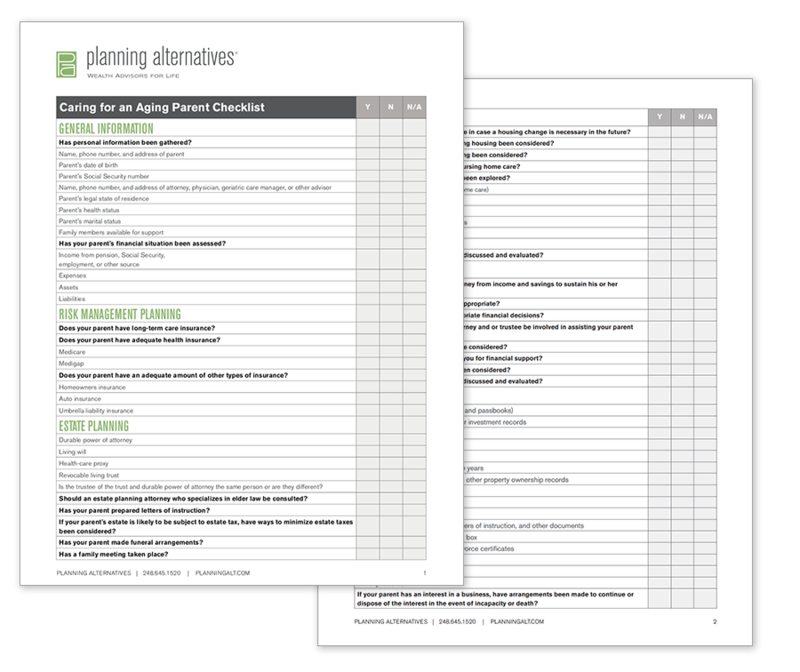 Click here – or the image below – to download a PDF of Planning Alternatives’ Caring for an Aging Parent Checklist.